So let's say you've managed to get your hands on one of the highly coveted new SNES Classic Mini systems. First, good for you! But let's also say you decide that traditional wired controller is a little too true to the original SNES experience for your decidedly modern tastes. 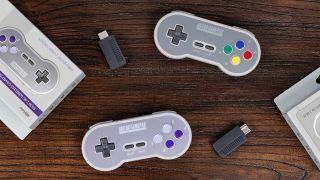 The good news is that 8bitdo is releasing a wireless controller for the SNES Classic Edition, which looks almost like the native one but with a slightly grayer face. Just pop the wireless accompanying wireless dongle into the slot where you'd place the standard controller wires and you're good to go! Even better, 8bitdo's gamepad solves the annoying lack of a home button on the SNES Classic controller by allowing you to access the system's main menu by holding the down and select button at the same time. That means, of course, missing out of the authentic early '90s experience getting up and handling the system proper if you want to change what game you're playing. So what's the bad news? Only that it won't ship from Amazon until December 10. On the bright side, that's still plenty of time for it to arrive if you intend to make the SNES Classic a holiday gift. When it does become available, the controller will cost $24.99 (about £18.66 / AU$31.89). 8bitdo has made a bit of a name for itself in fixing Nintendo's shortcomings in this regard. It made a similar controller for the NES Classic Mini, for instance, which resembled the 1985 original but came with an anachronistic (though helpful) four-button setup. Even better, 8bitdo released an adapter so you can use the device with Nintendo's contemporary Switch console. The NES controller, though, isn't the most interesting product the company has released. Around the same time 8Bitdo released the NES gamepad, it also released its AP40 controller that's compatible with everything from iOS and Android to, yes, your ancient Apple II.